Enjoy the beautiful scenery of Montana in our deluxe accommodations at The Great Bear Inn. Enjoy the beautiful scenery of Montana in our deluxe accommodations at The Great Bear Inn. Glacier National Park is less than ten minutes away and the inn will provide with a tranquil setting in a picturesque area. The area provides countless recreational activities and Glacier National Park’s beauty in the summer is not to be missed. However the area is also an all-season playground with endless activities for people of all ages, in fall, winter, spring and summer. You can also enjoy a relaxing evening in the beautiful Montana environment on the expansive deck at The Great Bear Inn. 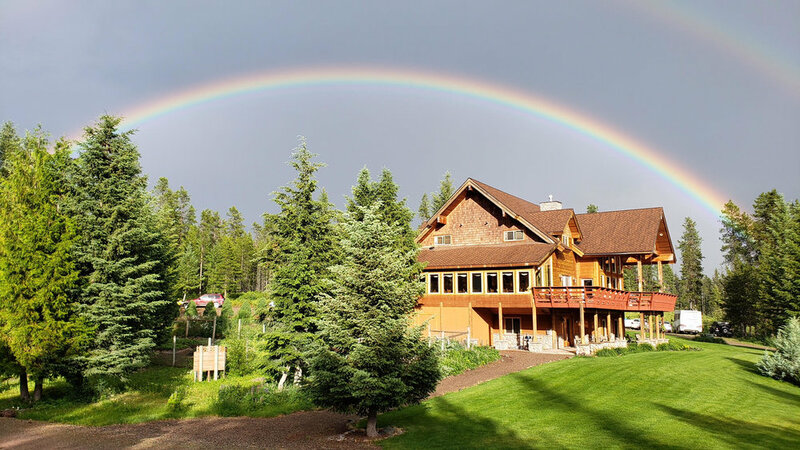 The scenery is breathtaking, the Inn is tastefully decorated and the location is secluded yet only few minutes from the West entrance of Glacier National Park. Included in our rates is an oversized continental breakfast served every morning. The ultimate in comfort, these superior accommodations proudly offer king-sized canopy Beds, custom bedding, large rock fireplaces, sitting areas, private outdoor patios, and more. Tucked away in a private wilderness setting, your cabin stay will take you away from the hectic pace of life. Both cabins have loft bedrooms with two queen-sized beds and a main floor queen bedroom, full bath downstairs and kitchen with dishwasher and BBQ. Each of our Deluxe Rooms are tastefully decorated in either Native American style or reflecting the beauty of Glacier National Park. Each room includes your choice of one or two queen-sized beds.